Chill in refrigerator, if you can wait. Not hard to make, as long as you get the avocado ripe! Cut the avocado(s) in half, remove pit(s), scrape contents into mixing bowl. Dice avocado, using a nice sharp knife, in mixing bowl. No mess, knife goes right through. Immediately add lime juice, to keep avocado green, and mix well. Smash, then mince garlic, mix into diced avocado. 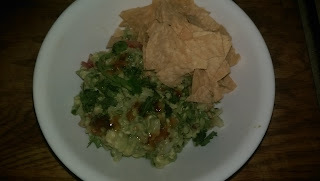 Dice jalapeno and onion, mix into avocado mix. Dice tomato, mix into avocado mix. Chop cilantro, mix into avocado mix. Garnish with a couple cilantro stalks, and some tomato (or a splash of Mae Ploy), and serve. Mix all ingredients, adding chili sauce, soy sauce, oil, and lime juice a bit at a time, and to taste, until the mixture is thin enough to pour. Make it thin, to marinate cucumber slices - medium thick, to use as salad dressing - or really thick, to use as dip for sourdough bread, or taco chips. 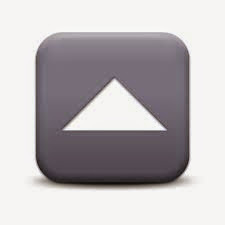 The one rule is that you should make it in quantity, because it will be eaten in quantity. Inspired by Season With Spice: Easy Thai Peanut Sauce - and limited by reality (and what I had in my kitchen). (**) Follow Safety Precautions when you prepare this, please. I ran out of dried mint a month ago, and I've been waiting to get another bag. I finally got the opportunity to visit my favorite Middle Eastern grocery, this week. A huge bag of dried mint, for $3.00 ($20.00 worth, at a supermarket). Plus caraway, cardamom, and ginger root. 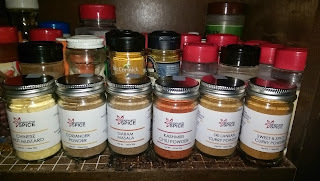 I'll buy spices in plastic bags, especially at these prices - but I hate storing spices in the bags, when I have this collection of empty spice jars. The jars are way more convenient to open, when I cook. This is at least $50.00 at supermarket prices (except you can't get black caraway, anywhere). At Afghan Market in Concord, this was just over $10.00. Unlike my last spice purchase, I know everything here. The black caraway is an essential in my chili and similar dishes - Cuban Style Black Beans, for instance. And the mint will go into a lot of dishes - including the Sesame Mint Rice. A most satisfying afternoon shopping. 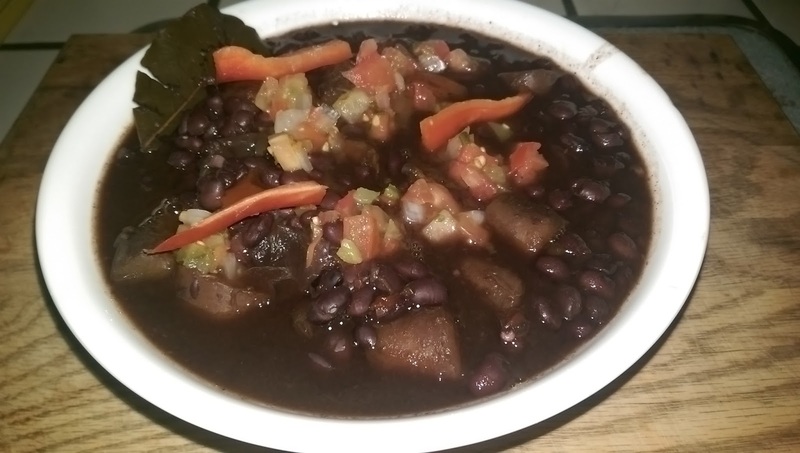 This is similar to California style red beans - except the flavourings use a curry powder base, instead of chili powder - and the lime / peanut butter. And, it takes some from the Cuban style black beans - except the sour black beans use an orange, but the red beans are sweeter and use a lime. Only rinse the beans twice, to make sure they are clean - then stash in refrigerator, in water, while you prepare the other ingredients. No soaking overnight - and no repeated rinsing, and removing all of the flavour. Rinse beans, twice, in large bowl. Let them sit in the refrigerator, in water, while you prepare the vegetables. Add vegetables, and enough water to make everything float. Bring water to a boil, and add spices. Do not add lime, peanut butter, or tomato sauce, yet. Reduce to simmer, cover, and let them cook. 2 hours gives me what I like. Sample beans and sauce, an hour after start. If the beans and spices make you sneeze, you have just enough spices. The peanut butter and tomato sauce will bring the spice level down. At 1 1/2 hours, the beans will be chewy. Add peanut butter, using a fork, stir until dissolved and mixed. Then add tomato sauce and the lime, stir again. Serve over Bengali style sesame mint rice, with sourdough bread. 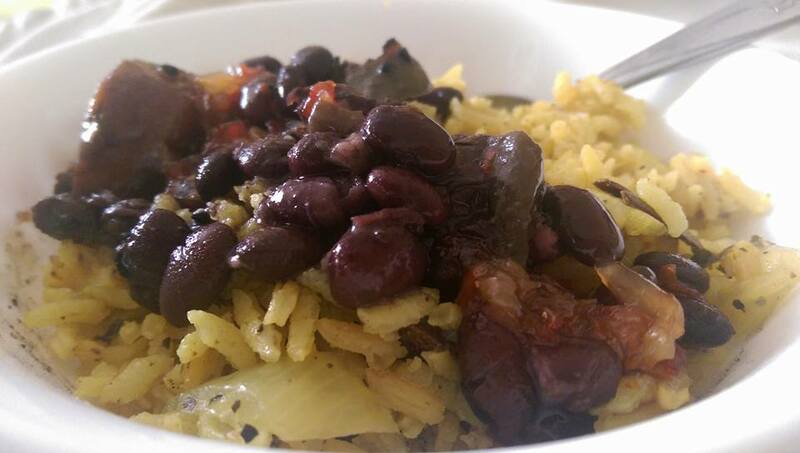 This is similar to Cuban style black beans - except the flavourings use a chili powder base, instead of curry powder. Reduce to simmer, cover, and let them cook. 2 hours gives me what I like. Serve over Bengali style sesame mint rice, with sourdough bread. Garnish / mix with mango salsa. 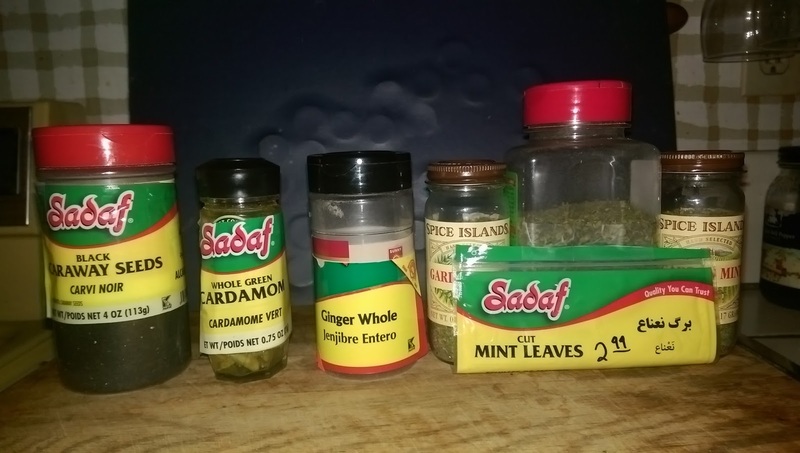 After some urging by friends, I tossed some of my older spices. This week, I ordered some new ones, to replace a few that I ran out of recently - and to try some different ones. Sent by Mark & Reese at Season With Spice, using USPS Express Mail. 3 days after placing the order, I was taking the picture. Now, to find some new recipes. I am familiar with coriander and mustard. And I have a few curry recipes. 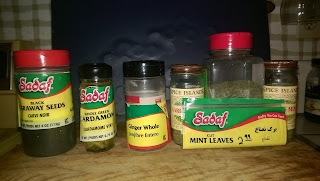 Garam Masala I am just learning - and the other two will be completely new. So, Google is your friend, we'll see what happens. The difference is in how you cook it. This is plain old white rice, see how more interesting it looks? 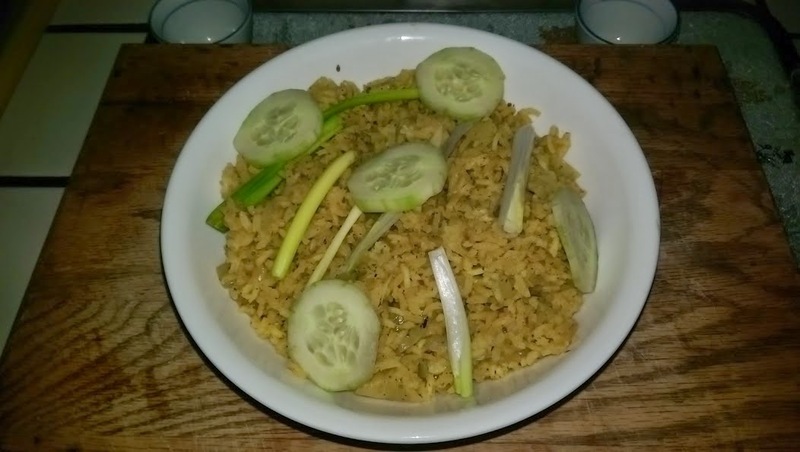 An online friend gave me a link to a video from a Bangladeshi cooking show (below), where they demonstrate how to cook Basmati rice. Well, I speak not a word of Bengali, nor do I have any Basmati rice - but the technique used, in cooking the rice, interested me. I've eaten lots of Chinese fried rice (wok cooked), this was the first time I tried frying it myself (in a deep pot, no less). Hear up a dutch oven, add cooking oil to cover the bottom. Saute garlic, 15 - 30 seconds, stirring constantly, just until it gives off an aroma. Add jalapeno, saute 10 - 15 seconds, stirring constantly. Add onion, saute until it starts to become transparent, stirring constantly. Remove veg mixture, save in bowl. Add more oil, to again cover the bottom of the pot, and add rice. 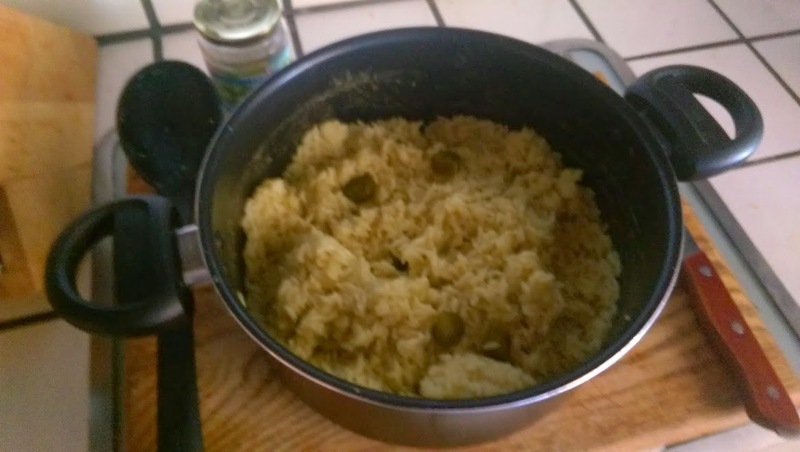 Saute rice, 2 - 3 minutes, stirring frequently, until the rice stops sticking to the side of the pot. The rice will have an aroma, too. Add sesame seed, and mint, stir 30 - 60 seconds, until sesame seed starts to brown. Add herbs and spices. Make a hole in the rice, to expose the bottom of the pot - and pour the herbs and spices onto the bottom, so it heats up. Then stir just enough to mix well with the rice. Add water, bring to boil, stirring occasionally. Reduce to simmer, cover, cook until visible water is gone, stirring occasionally. When visible water is gone, and you cannot hear boiling, stir once more, turn stove off, stir again, cover, and let it sit. Have faith, do not remove the lid to check. Let it sit for 10 - 15 minutes, then uncover. When rice is soft, you're done. Garnish / mix with chopped celery / cucumber / green onion / tomato. 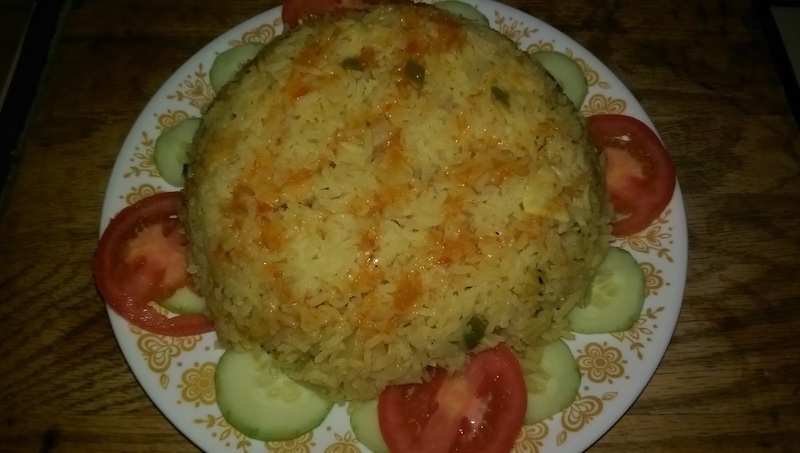 You get flaky, soft rice, with a nutty flavour, and a hint of ginger and mint. It's not Basmati rice - that's a registered trademark - but it's not sticky like my previous Sesame Mint Rice. In truth, the only things common between my recipe and the one in the video is "rice", onion, and probably tumeric (maybe cinnamon?). It was still educational, learning how to fry rice. Sesame Mint Rice, topped aith Cuban Style Black Beans.